When the Belgian city of Mons (population 93,000) was designated European Capital of Culture 2015 (along with Czech town Pizen), it already had more historic assets than many a city 10 times as large, and three UNESCO World Heritage listings. But like a Belgian chocolatier whipping up a selection of pralines and truffles, Mons has reinvented and created new temptations, including five new museums, a concert hall, a restored van Gogh site and more than 15 urban installations. The museums got off to a great start with 50,000 visitors on the opening Easter weekend. But are Mons' new cultural offerings as irresistible as a box of Belgian chocolates? 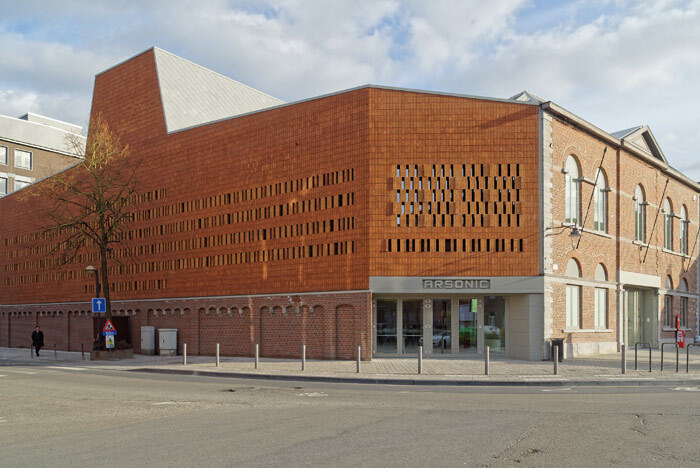 Mons is a town of tight, steep-roofed brick houses and narrow lanes centred on a grand historic square, its fabric embedded with great buildings marking styles from medieval-gothic to contemporary (the latest is Libeskind's MICX conference centre). But it is also a working-class town - Wallonia, Belgium's Frenchspeaking south, was second only to England to industrialise, and then to decline after the Second World War. Yves Vasseur, the Capital of Culture programme's artistic director, wants a 'metamorphosis of spirit'. He admits that 'we have a lost generation who will not become cultural ambassadors. But their children and grandchildren will'. The big idea, he says, is 'Mons: Where technology meets culture'. Some museums have taken this literally. Just behind the town hall is the €4m Musée du Doudou, a handsome, red-brick, four-storey building from 1625, now converted by architecture practice Sofateliers into a museum about the town's yearly festival, the Ducasse. Otherwise quiet for 51 weeks a year, Mons has always turned out in droves for its ritual, colour, sound, fantasy and frenzied affirmation of local identity. It starts with honouring the seventh-century relic remains of Saint Waudru, and culminates in a great staged battle between St George and the dragon, or 'doudou'. But what if you can't make the Doudou? No worries - now, panoramic screens replay its crescendo all year round. It's an emerging trend, offering a bridge to what's nearby but beyond reach. Stonehenge Visitor Centre has another example of being there virtually, taking you to the centre of the stones. At least this trend is localised at source... for now. At the Artothèque, an €11m project, technology plays a different game with cultural assets, in this case the city's eclectic collection of art and artefacts. 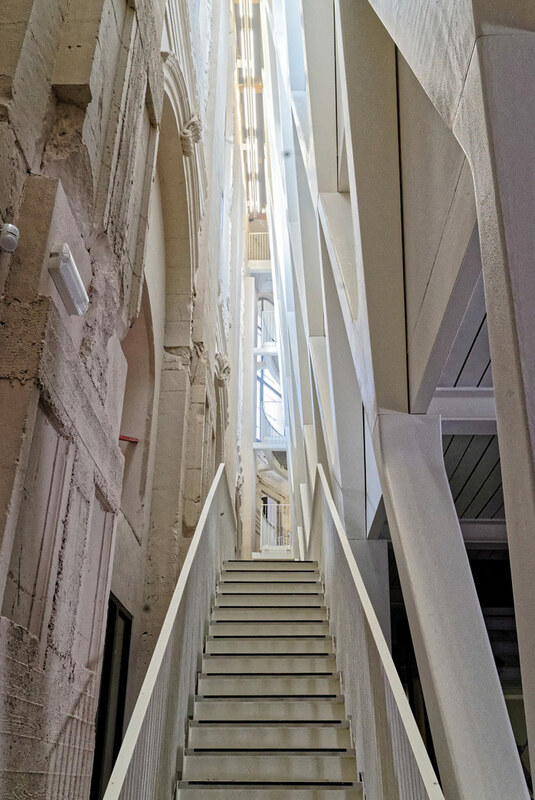 A new volume has been inserted into a tall, 17th-century chapel interior, and stairs lead up the narrow gap between the old wall and the new steel truss, described by architecture practice Gigogne as 'a sloping fault line', but only the ground floor is open to the public. The architecture is outstanding but displays are initially puzzling. Paintings are mounted on storage racks and objects appear in vitrines or drawers, yet nothing is labelled. Identification is through horizontal touchscreens, which let you drill into the information with swipes and pokes, or wall screens which deliver crisp images. It's all about a new way of discovering art, a 'museum lab' that links into the conservation work there. The experience is fascinating but again launches into the virtual, in this case an ephemerally mapped sea of information. Will such high-tech resources endure? Ultimately, data decays, formats become redundant, and, over centuries, even electricity is uncertain. Thankfully the other new museums are more reliant on physical presentation. 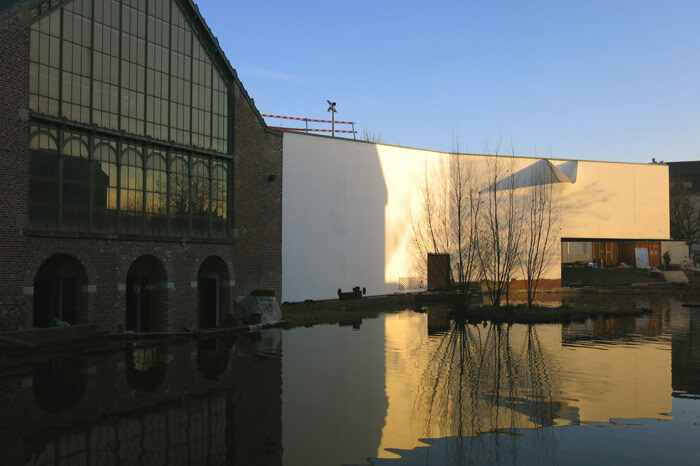 The best is the Mons Memorial Museum, a €7m project which has converted the 1871 Machine à Eau, a metal and glass waterworks, into an airy reception. The galleries occupy new wings and the place opens to the water behind the building. Pierre Hebberlinck, the Liège architect responsible, says 'a museum should not be just a cognitive instrument, but a perceptive instrument'. Perception here is shaped by acts such as exposing the materiality of original structure ('we wanted to keep the memory') and interventions with minimalist, but massive, white, structural steel. The First World War's last shot was fired in Mons. Dramatically black angled-steel vitrines and poignant displays of soldiers' modest personal effects bring home the tragedy of war. Two new attractions lie just outside town. At Cuesmes is a restored house where van Gogh lived in 1880 during his Christian evangelist period. Stripped to a white gallery space inside, only one section along a wall evokes the artist's time there. A coat and hat hang by a kettle on a stove, a cross stands on a writing table, and doesn't that old straw chair pointedly angled from it remind you of something? Van Gogh's Chair painting was actually done in Arles in 1888. Rather than virtual reality, this is a reality reconstructed. No need to recreate the past out at Spiennes, a neolithic flint mine active 6,400 years ago. Inside a new €3m museum curiously called Silex's, the real thing can be accessed by donning a hard hat and descending a ladder into caverns. 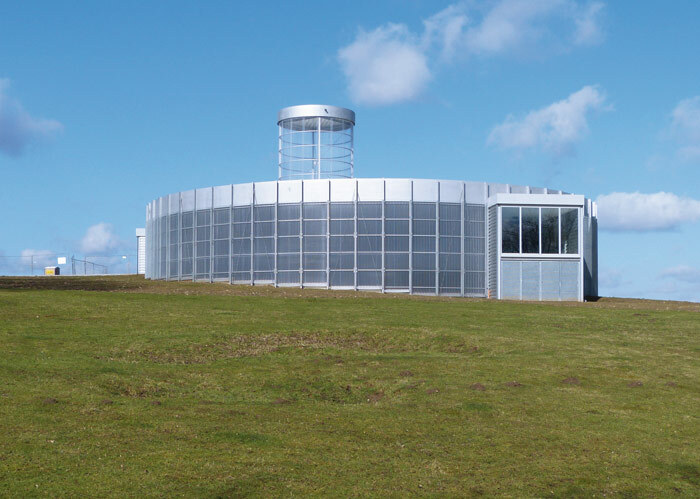 It's situated in a translucent, drum-shaped, galvanised steel structure topped by a skylight cylinder and wrapped in translucent polycarbonates. Non-digital displays about the prehistory and archeology are on floors mounted on stilts above the raw ground. It can get chilly there - to protect the site there's no heating. There's something intriguingly science-fiction and deliberately remote about local architecture practice's Holoffe and Vermeersch (H&V)'s building, like an outpost built on another world, beyond our civilisation. Compared to the mines, Mons rose only yesterday. Back in town, H&V's other new work, the concert hall Arsonic, is clearly a building of today. The solid brick skin, perforated by double-brick-sized slits, blend it into the townscape, but a trapezoid tower for plant gives the volume a sculptural abstraction. Inside, as well as a James Turrell-inspired Room of Silence, there is a new auditorium, an asymmetric box that holds 250, with wooden panelling. I can testify to the excellence of the acoustics - the man who engineered them, Eckhardt Kahle, whipped out a violin and played some Bach on my visit. Out in the streets, Mons' urban installations (until September, some permanent) pop up everywhere. Calvin Dussart and Charles Myncke, students from local college Art2, have filled blank windows with Hollywood poster images from the Fifties, and called it True Story. Élodie Antoine's Sloths hang out in a tree in the Place du Parc. By the municipal government offices, Inject Love's City Says No is a heart-shaped array of 'forbidden' notices. 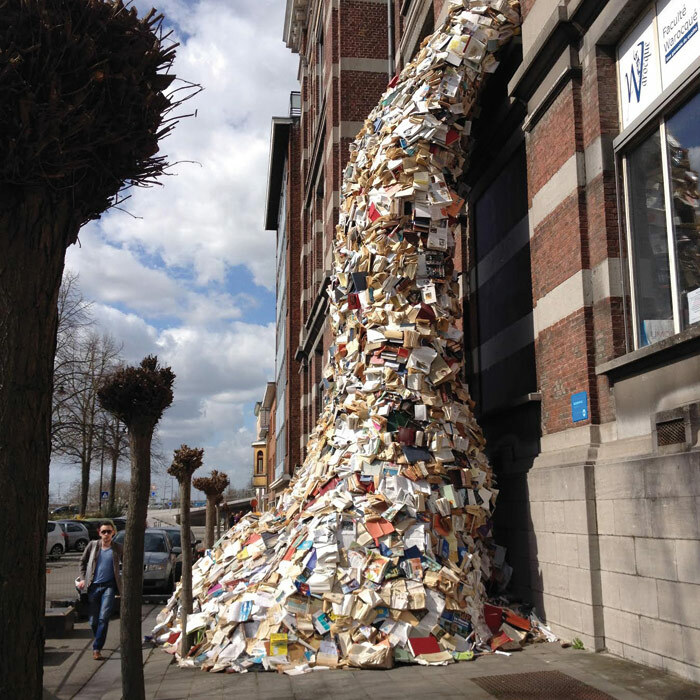 Most dramatic of all, a college building spews books out of a window in Alicia Martin's Biografias. Belgium was once a surrealist superpower - some of these artworks brilliantly revive that spirit of strangeness. The other thing that pops up everywhere is glimpses of Mons' magnificent 87m-high Belfry. Although finished in 1672 to Louis Ledoux's uniquely baroque design, it counts as a new museum. Bureau Dupire- François's €7m works have not just restored this sentinel of civil liberty, but put exhibition space throughout its height. Accessing the vertiginous top to behold the jumbly town, its centuries and structure, as readable as a book, is simply breathtaking. As Cultural Capital, Mons has sexed up its assets, added more, and injected contemporary creative sparkle into the mix, including a diverse events programme. It all beats any chocolate selection. The digital dimension may wow, but Mons' revitalised sights and sites, and perhaps the Doudou itself, will outlast the digital overlay.